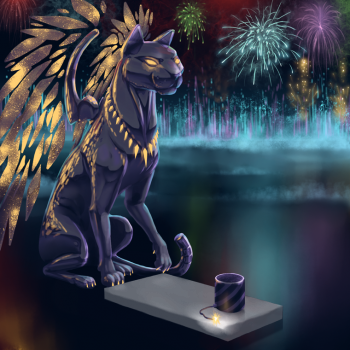 In a constant state of celebration, this sleek sphynx shimmers beneath a sky blazing full of fireworks. The commotion of combustion creates colourful confusion that the sphynx can clandestinely creep to capture those tiny creatures it has been confusing! The New Year's Chrome Sphynx Wrath Trap Skin can be used on the Chrome Sphynx Wrath. The trap's stats (power, power bonus, attraction bonus, etc.) are not changed. The New Year's Chrome Sphynx Wrath Trap Skin may be made available during the annual Great Winter Hunt event and can be traded on the Marketplace or through Give To Friends. 27 December 2018: The New Year's Chrome Sphynx Wrath Trap Skin was released as part of the Great Winter Hunt 2018. This page was last edited on 6 February 2019, at 15:49.